Tornadoes are the most violent storms in nature. Almost 1200 tornadoes strike every year across the United States. Winds can reach more than 200 miles per hour, and they can destroy a neighborhood in seconds, leaving behind loss and chaos. Every year, thousands hold their breath as they watch 15 to 20 of these deadly rotating clouds of fury pass through the Commonwealth. The destruction and injury depends upon the size, intensity, path, time of day, and length of time the tornado stays on the ground. They can occur in any season but are most likely in the spring and summer. Tornadoes frequently occur between the hours of 3 p.m. and 9 p.m. Most injuries and fatalities from tornadoes are caused by flying debris. When a tornado strikes, it is vital to go to the safest place for protection and to seek personal cover. Know the difference in a tornado watch and a tornado warning. A tornado watch means that the weather conditions are possible to produce a tornado. A tornado warning means that a tornado has been sighted or indicated by weather radar. Tornado warnings indicate imminent danger and those in the warning area should go to a safe place of cover immediately. The best protection in a tornado is underground in a basement, cellar, a storm shelter, or in a safe room built to FEMA standards. These shelters greatly increase survival chances. If an underground shelter is not available, it is recommended that you seek protection in a small windowless room in a sturdy building, such as a bathroom, interior hallway, or closet. It is strongly recommended that these be on the first floor. One should use additional personal cover as you gather in this interior space. Use what is available to cover yourself, such as a mattress, blanket, or coat. Cover your head and neck with your arms. 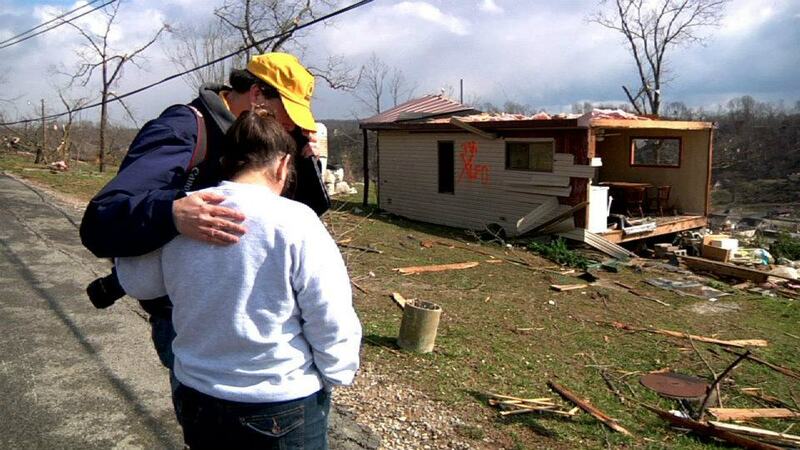 Mobile homes, malls, gyms, warehouses, vehicles, and the outdoors do not provide safe protection against tornadoes. Families should have a plan that includes a first aid kit, emergency supplies, and a place for all family members to meet following a disaster. It is recommended that families have two pre-determined meeting places. As always, being prepared greatly increases you and your family’s ability to survive when a disaster strikes.